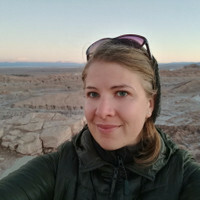 Emily is our Destination Expert in Chile. "Emily was amazing and planned every detail of our tour of the Chilean wine region. She reserved priv...". Travel to one of the most remote places on the planet– Easter Island. On this 7-day adventure, you will discover the island through different perspectives and activities. See the mysterious moai stone statues that are all part of the Rapa Nui National Park, a UNESCO World Heritage site. You can spot these giant statues at various places and explore the island’s attractions through hiking, snorkeling, kayaking, horse-back riding and even stargazing. Learn about the archaeoastronomy of the Rapa Nui culture, and see extinct volcanoes, petroglyphs and unique villages. During your entire trip, an English-speaking guide will accompany you and share with you the secrets of this mystical place.​​​​​​​ Come along, discover the magic of Easter Island! Easter Island is famous for the moai statues standing on ahu (stone platforms) that dot its landscape. On your trip, you will get a close look at these mysterious figures and other attractions on the island. After touching down at the Hanga Roa airport on Easter Island, your driver will take you to your hotel. Later, meet your guide who will give you the Rapa Nui National Park ticket. Proceed to the archaeological site of Ahu Vinapu and then to the Puna Pau volcano. 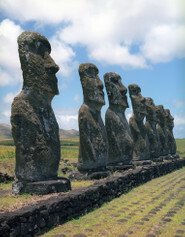 The reddish pukao (hats or topknots) sculpted on some of the moai statues were sourced from the volcanic rock at Puna Pau. 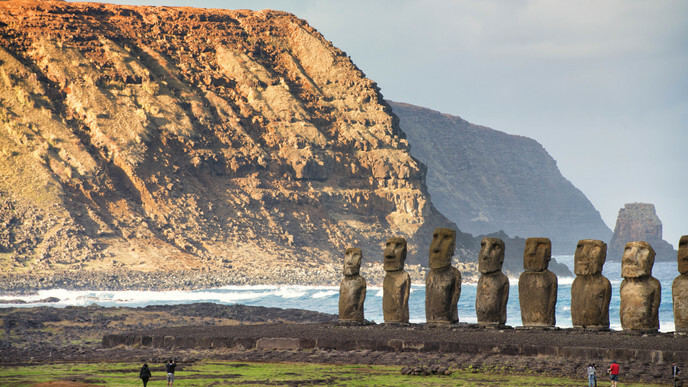 Did you know that moai statues were built with their backs to the ocean? But there is one exception at the site of Akivi. Here, you will see, the seven moai of Ahu Akivi, the only ones on the island that face the sea the only ones on the island that face the sea. There are many fascinating theories and stories to explain their position. It’s time to discover some of the other wonders of Easter Island. First, you will head to the beach of Anakena, a beautiful sandy stretch with palm trees and crystal clear water. Here, you can also see Ahu Ature Huki with a single moai. Up next are other captivating sites and archaeological treasures. You will stop at Papa Vaka to see some petroglyphs. Most of the images on the rocks are related to the ocean and marine life. Later, you will go to Ahu Te Pito and see the tallest moai statue to have been transported, now fallen to the ground. You will then make your way to the famous 15 moai in Tongariki – these are among the most well-known of the moai on Easter Island and the largest ahu. Standing in a row, they make for an impressive sight. Afterward, you will proceed to the mesmerizing moai quarry on the slopes of the Rano Raraku volcano. Here, you can also see unfinished moai that have been standing there for ages. Would you like to explore the scenic outdoors and the ocean just like a Polynesian voyager? Your journey will start at Anakena beach along with a small group headed by a kayak instructor. After some moments on the beach, you will set off to discover Rapa Nui from the sea. Your instructor will teach you to row Polynesian style! Kayak to the little creek of Ovahe. Enjoy a one hour guided snorkeling adventure in the clear waters here. Afterward, rest for a while and then get on your kayak and row back to Anakena. Put on your walking shoes and set out to see some more sights on Easter Island. First, your trekking guide will accompany you by car to the Poike Peninsula. From here, you will proceed on foot. Your first stop is the Vai a Heva, an interesting sculpture – it is a human face with an open mouth carved on the rock. Continue your trek to the top of Pua Ka Tiki, the highest point in the area for a 360° panoramic view of Easter Island. Walk onwards to explore Ana O Keke, the cave of the virgins and listen to the story associated with it. After a day of trekking and visiting the fabulous sites along the way, you will return to your hotel. Set forth from your hotel and hike to the Rano Kau volcano. Along the way, see spectacular views including the crater lake of the volcano. You will enter the ceremonial site of Orongo that has the largest number of petroglyphs in Polynesia. Explore the village of Orongo with its stone houses. It is known for the cult of Tangata Manu or Birdman that existed a couple of centuries ago. Later, in the evening, you will enjoy a fabulous stargazing experience in a small group. It will take you back in time to the world of the Polynesian voyagers. Your guide will inform you about the Polynesian voyaging history and the archaeoastronomy of Rapa Nui. Listen to spellbinding stories as your guide points out stars and constellations of interest to the Polynesian navigators. Take photographs. End the night on a sweet note with a cup of hot chocolate and a slice of poʻe, similar to banana bread. Did you know that horseback riding is a popular way to explore parts of the island? Today, you will ride to the Terevaka, the youngest volcano on the island. The ride starts from the Hanga Roa village along the west coast towards the Akivi site of the seven moai. It is said to represent the seven explorers who came to the island to make way for the King Hotu Matu’a. From here, you will start the relatively easy climb to the highest summit of the island, the Terevaka volcano. Feel the wind on your face and enjoy an incredible 360° view from the top. Your Easter Island adventure has come to an end. Proceed to the Hanga Roa airport with your guide. Catch your plane home.